Gabby Harding plays for the Men's Junior B team, but more recently has played a number of important matches for the Junior A's. He is our very own ever lasting goal stopper! 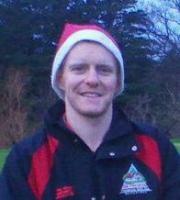 Gabby currently coaches the Under 12's as well as the Dublin Ladies Under12's Development panel. Favourite Player: Paddy Cullen, my first Dublin match was the All Ireland Final in 1974, Dublin won, and Paddy Cullen saved a penalty, after that game all I ever wanted to do was play in goal. Favourite Moment playing for Wanderers: Winning the league in 2011. Favourite Pitch: I played a few times on PÃ¡irc UÃ­ Chaoimh which was great, But Frank Kelly Park, on a wet and windy day, it's a cauldron. Least Favourite Drill: Anything to do with running. Favourite Dublin Player: Stephen Cluxton. Future Dublin Player: Lorcan Molloy, bags of talent and excellent goalkeeper. Favourite Non Dublin Player: Jimmy Barry Murphy (Cork). Laziest team mate in training: between myself and Christy "Big Red" Mangan. Funniest thing you heard in a dressing room: Not in a dressing room, but in a hospital after chipping a finger bone, the specialist looked at the x-ray and then my chart, noted my age, and suggested I take up Chess instead! Best Player you played with: Arthur " Aki" Browne from Tipp, I played with him for my School St Augustines College, Dungarvan, Co Waterford Football & hurling teams, We reached 3 Munster Finals, 75% of that was down to Aki. Where did you watch the 2011 All Ireland Final? : Dineen Hill 16. Best football advice ever received: I was told by a priest in school that I will go a long way in football and hurling if I stay away from drinking and women, Ah well. Thanks to Gabby for his answers. Cluxton and Molloy are very decent keepers, you're not bad either Gabby! !